Bear recently hung out with one of Ecuador's most popular professional soccer clubs - the Barcelona Sporting Club - during the last couple days of their pre-season training camp in Rio Verde. Check out his photo slideshow accompanying Noah Schumer's story at The New York Times. Earlier this week, Ecuador became the only South American national soccer team to be eliminated from the first phase of the World Cup. This was a sad thing to witness in a country where soccer fever is as strong as anywhere else in the region; a place where “hincha” culture is big. On the day of the defeat, so many people donning the yellow jerseys they’d bought on the street for $10. 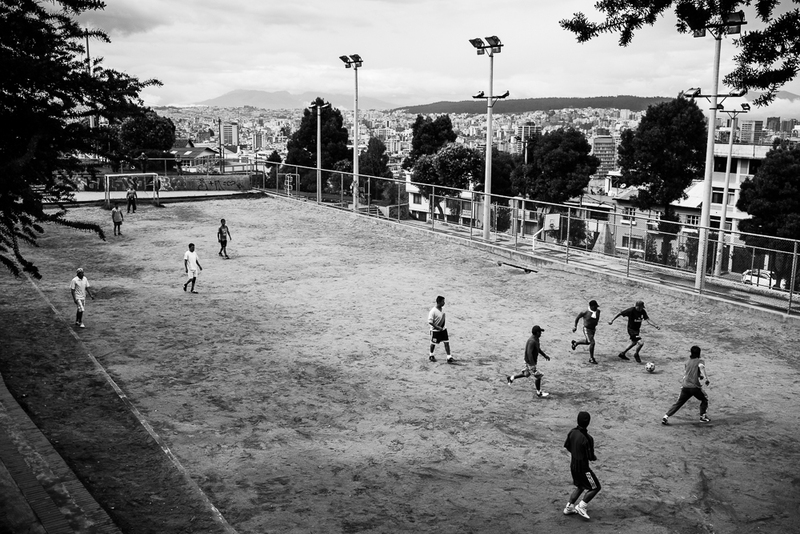 Recently, there was even an article in Ecuador’s El Comercio paper saying that some of the street vendors selling soccer jerseys had made all their money for the month, and were betting on yet another win. Bars and restaurants capitalized on the event by showing off their enormous high-definition television sets. Government offices closed at 2:30 pm, to give people 30 minutes to get to the bar or the mall or home, wherever they could park to watch the game. We watched it at home, with the volume down. After the 90-plus minute mark, a tie, absolute silence. Since then, not a single yellow jersey in sight.